Probiotics typically aim to rebalance bacteria populations in the gut, but new research suggests they may also help break apart stubborn biofilms. Biofilms are living microbial communities–they provide a haven for microbes and are often resistant to antibiotics. A new study describes a specific probiotic mix that could help patients with gastrointestinal diseases avoid harmful biofilms that can worsen their symptoms. The study evaluated the ability of a novel probiotic to prevent and treat biofilms containing yeast and bacteria–in particular, species that thrive in damaged guts. Biofilms can contain an infectious polymicrobial mix of bacteria and fungi all living together underneath a thick protective slime. These polymicrobial communities are resistant to antibiotics, but can be antagonized by other microbes. Other microbes living in the gut–or administered via probiotics–can help break apart biofilms, according to the new study. In a series of experiments published in The American Society for Microbiology’s journal mBio, researchers from Case Western Reserve University and University Hospitals (UH) Cleveland Medical Center grew yeast (Candida species) and bacteria (Escherichia coli and Serratia marcescens) into biofilms. They then exposed the biofilms to a promising probiotic mix identified in a previous study–one part yeast, three parts bacteria, and a small amount of amylase (an enzyme found in saliva). Microscope images showed biofilms exposed to the mix were looser-knit communities that were overall thinner and weaker than untreated biofilms. The researchers found the probiotic worked in part by weakening yeast living in young biofilms. The yeast inside the biofilms were stunted in growth and did not form reproductive structures that help seed new biofilm growth and expansion. The researchers concluded their novel probiotic mix might help prevent harmful biofilms in people with inflammatory bowel disease or other gastrointestinal conditions. “A probiotic can prevent and treat biofilms that are found in the gut,” said senior author Mahmoud A. Ghannoum, PhD. “This is a big issue since gut biofilm correlates with Crohn’s disease and colorectal cancer.” Ghannoum is professor and director of the Center for Medical Mycology at Case Western Reserve School of Medicine and UH. Previous work by Ghannoum conducted at the School of Medicine and UH showed the three types of microbes the researchers grew inside their biofilms (Candida species, E. coli, and S. marcescens) are significantly elevated in the guts of people with Crohn’s disease. Together, they form an especially thick biofilm that can trigger inflammation in the gut. Probiotics could represent a new way to manage such painful inflammation, Ghannoum says. The researchers further studied biofilms found in Crohn’s disease patients by growing yeast and bacteria in several different combinations. They found Candida yeast species are more likely to team up with the bacteria in biofilms than other yeast species. Additional results show both Candida albicans and Candida tropicalis form thick biofilms when grown alongside E. coli and S. marcescens bacteria. 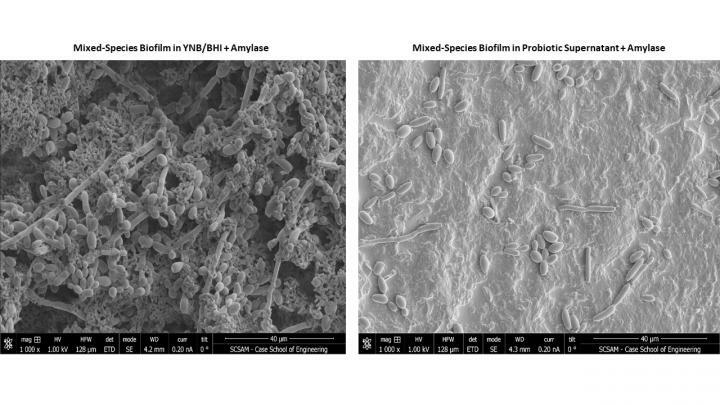 Other non-Candida yeast species could only form thin biofilms–not any thicker than a single species grown alone. The results point to Candida species as most likely to form thick, stubborn biofilms in patient guts that may be susceptible to the probiotic. The liquid probiotic itself was strained of whole, beneficial microbes before testing, leaving behind metabolites and enzymes secreted by the microbes. The researchers are now investigating exactly which secreted factors inside the mixture are responsible for the anti-biofilm effects. They have also applied for a patent on their probiotic. The patent-pending probiotic is currently marketed as BIOHM Probiotics, a general digestive health probiotic. This work was entirely funded by BIOHMhealth, of which Ghannoum is a co-founder and equity owner. Hager CL, et al. “The Effect of a Novel Probiotic Combination on Pathogenic Bacterial-Fungal Polymicrobial Biofilms.” mBio (2019). For more information about Case Western Reserve University School of Medicine, please visit: case.edu/medicine.